First impressions are everything when selling your home. A buyer may ask probing, sophisticated questions about house maintenance, the condition of your appliances or the quality of your neighborhood and schools, but these factors pale in comparison to the feeling a buyer gets the first time he or she steps into your home. If you want to sell your house for the most amount of money and with a minimum of time and hassle, it's critical that your decor puts the house's best foot forward. You can think of your home's interior walls as an important backdrop; they set the stage for the furnishings and decorations that give rooms their unique feel. Picking the right paint for each room, however, is a topic that causes frustration for many. Paint is relatively simple to apply or change, but the wrong color in one room can turn a buyer off from the entire house. To safeguard against this, paint all of your home's interior walls in neutral colors. If you're still living in the home you're selling, though, does that mean you're stuck inside a bland, beige nightmare? Not necessarily. Remember, the term "neutral colors" doesn't limit you to shades of white and beige. With a little preplanning and a sense for the effect color has on the human mind, you can use browns, greens and even bolder colors to highlight your home. Read on to learn about five colors that may put visitors in the buying frame of mind. Gray shades have gained in popularity over the last few years as go-to choices for decorators wanting to add chic, urban sophistication to their rooms. When combined with furniture and trim in light, neutral shades, a dark gray accent can become a bold focal point. In addition, the light decor and gray wall combination can work well with a handful of bright, colorful accents, such as a shiny green lamp or metallic red chair. But be careful. This bold style might turn some people off and it can come across as imposing to buyers. 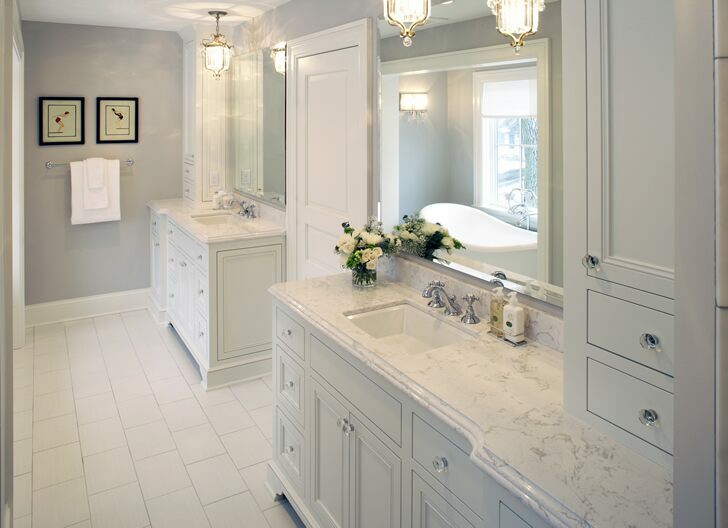 The key to using gray effectively is to pair the right shade with your home's overall feel. If you're selling a trendy urban loft, you may be able to use a dark gray to enhance the effect of sleek, modern furnishings. The same color would look completely out of place in a traditional home with conservative furnishings. In that case, you could use a light gray to bring a feeling of coolness to a bedroom since many grays border on shades of blue, their calming effects can be similar. Some rooms of a house are reserved for reflection, quiet contemplation and rest. Every home has a bedroom, study or child's room where the decor should create a cool, soothing environment. To bring about the best in these rooms of your house, consider using a shade of blue to enhance the mood. Blue, especially in its lighter shades, has a strong soothing effect on many people. It brings to mind images of clear, still days or the vast, meditative expanse of sky over the seashore. Blue walls in a room that gets a lot of natural light can take visitors back to a favorite beach or ski trip, and this pleasant experience can affect their impression of the entire room. An all-white room, or one painted in a light beige or brown, may come off feeling cold and flat; those tones reflect plenty of natural light, but their lack of color can create a feeling of emptiness. To remedy this problem, consider using a shade of yellow to bring a welcome level of warmth to the room. Yellow evokes images of sunlight, summer and clear, bright days when paired with white trim. When used with darker accents, such as stained cabinetry, the color can radiate the warmth of a kitchen full of home-baked breads and cookies. Which mood you want to create depends on your home's design. Imagine the house as a stage: Would one of these colors fit better in the theatrical scene you would most like to create? If there's one surefire range of colors on this list, it's earthy hues. After all, the beige that many real estate professionals love falls on the lighter end of this range. But don't write off brown as boring: By playing with the full range of browns in your decorating, you can be both safe and visually exciting as you prepare your home for sale. Brown, in its lightest shades, can provide subtle warmth and fix the problem of glare that often comes with an all-white room. As shades darken into sandy hues, brown becomes an effective color to bring a rich glow to a room. At its darkest shades, brown can be a comforting, cozy accent that keeps a room from feeling too large. Truly dark shades of brown should be saved for accents, such as a striking sofa or bookcase. Too much dark brown can give a room a cave-like feeling -- just think about the dreary, wood-paneled dens from the 1970s and '80s. Some homeowners like this effect, but for selling, you're much safer using a light brown as your main color and accents of darker hues to draw the eye into the space. As far as colors go, green sometimes gets lost in the shuffle. Too dark, and it seems blue or brown. Too light, and it might seem yellow. But in the middle of these extremes lies a versatile color that can help bring out the best in several design scenarios. Much like yellow, green in its lighter shades can bring a cheery, country coziness to a room with white trim. Pairing a green accent wall and decor items with a room that's mostly white can create a playful atmosphere that's perfect for a children's room. In its deeper shades, green is an excellent complement to natural-finished cabinetry; the combinations of wood stain and green hues are nearly endless. If you choose the right colors, your cabinets will glow with radiant warmth that invites visitors into a kitchen or cozy sitting room. Avoid deep green as it tends to feel dark, den-like. Dark green can be a great accent colour with calming effects. Deep green can be extremely elegant, but it's best used sparingly in a house for sale. A dark green accent can add warmth to a tile backsplash, but too much deep green has the same dark, den-like effect as too much dark brown in a room. If a space could work with a darker green accent. For more information on choosing colors, or for a free paint consultation as a part of a pre-selling staging consultation, give me a call!